Reading about the past, but, surprisingly, created to teach and practice Simple Present. 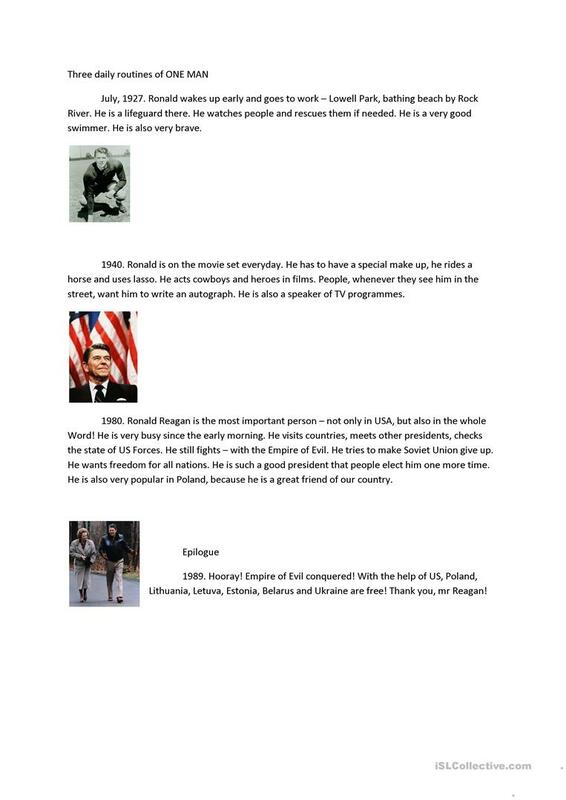 Ronald Reagan presented as a lifeguard, an actor and a president. The present downloadable printable is best suited for high school students, elementary school students and adults at Pre-intermediate (A2) and Intermediate (B1) level. It is aimed at practising Present simple tense in English, and was designed for working on your pupils' Reading skills. It features the vocabulary topic of Culture, intercultural communication, cross-cultural communication. counscience is from/lives in Poland and has been a member of iSLCollective since 2012-05-07 18:16:45. counscience last logged in on 2019-04-25 11:42:47, and has shared 7 resources on iSLCollective so far.